I am going to start today’s blog post with a confession, my name is Becky and I am a perfume addict! Yes in the past I have had a slight problem with buying perfume until I think I had over 30 different types. So a couple of years ago I made a conscious decision to not buy anymore until I had got through some of what I already had. I have been very good and have not bought any (although I have received the odd bottle or set as a present) and I have managed to get through a couple of bottles and have given several more away to my mum. I do still have quite a lot left though (a rough count just found around 14). 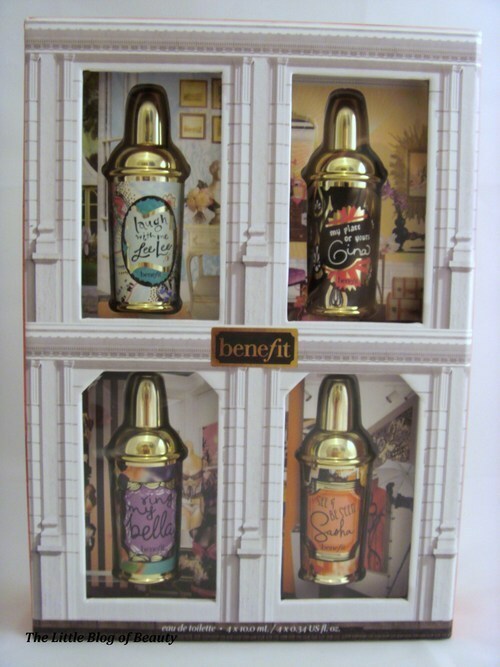 Now I have to admit that I have never considered Benefit for perfume because, well, I see Benefit as a makeup brand. For Christmas I was lucky enough to receive a Benefit set as one of many Christmas presents from my very generous boyfriend and in this set was a sample of Laugh with me Lee Lee. I loved this sample and was really disappointed when it ran out. However, said generous boyfriend also gave me some money to spend in the January sales so when I saw Benefit had a sale and that some fragrance products were included I decided to break my no buying perfume rule. I went for the Crescent Row Limited Edition set. 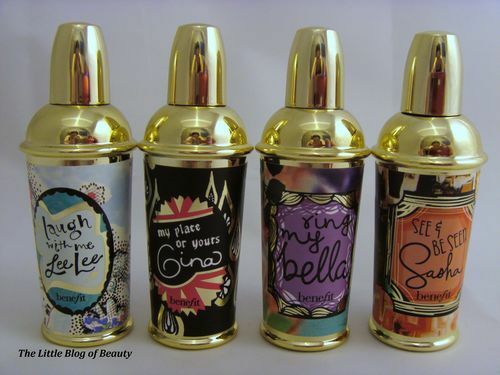 Three of these fragrances have a light floral scent (Lee Lee, Bella and Sasha) and one a stronger oriental scent (Gina). I think the floral scents would be great for the day and the oriental scent would probably be better for the evening. They come in unusual looking bottles (I’m told this is what perfume bottles looked like years ago but I’m too young to know about this!) and the miniature size of them (just under 3 inches) makes them really cute. 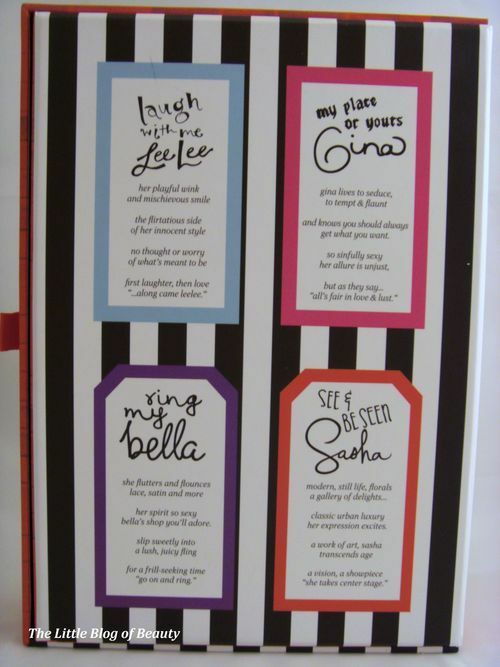 In true quirky Benefit style the back of the box also has a poem to represent each fragrance. My particular Crescent Row set is out of stock on the Benefit website http://www.benefitcosmetics.co.uk however a similar set is still available online and this may also still be available in stores.